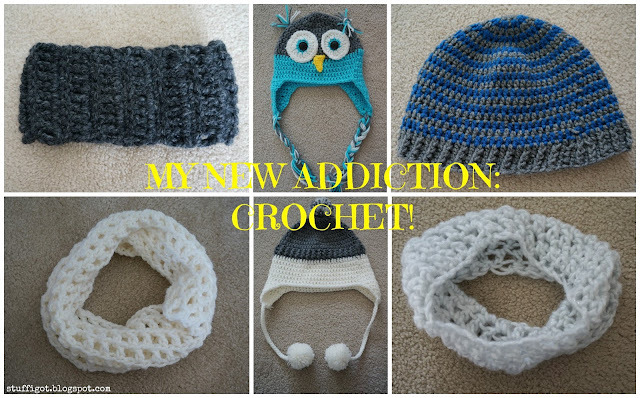 Crafty And Wanderfull Life: My New Addiction - Crochet! A few years ago, I had broken my ankle and needed something to do while I was stuck on the couch. So, I tried knitting. I picked up some books and watched a few YouTube tutorials. But, I never really got good at it. I made a few scarves and washcloths. I also attempted a baby blanket when I was pregnant with my fourth child, but I never got around to finishing it. It's still on the needles! About a month and a half ago, I decided I'd try to crochet. I wanted to make hats and I wasn't ready to try knitting in the round and using double-pointed needles and it looked like it would be easier to crochet a hat. So, I searched YouTube for videos on the basic stitches and for step-by-step tutorials so I could make a hat. I chose one tutorial that didn't look to be too hard. I was amazed at how quickly the hat worked up. And even though I somehow lost some stitches along the way and the hat meant for a child only fit my toddler, I was hooked! I set out to make more hats! By the time Christmas rolled around, I was able to make a couple hats and a few scarves for people. I'm going to be highlighting some of the favorite crochet projects that I've done so far and include links to where I found the pattern. No plans on selling anything yet, but eventually, I would love to set up a shop on Etsy! Do you crochet or knit? I'd love to see some of your projects!